We all seem to want more protein in the morning, don’t we? Without necessarily committing to bacon and eggs… or even to Greek yogurt or anything more substantial than something that can be grabbed and nibbled with coffee. 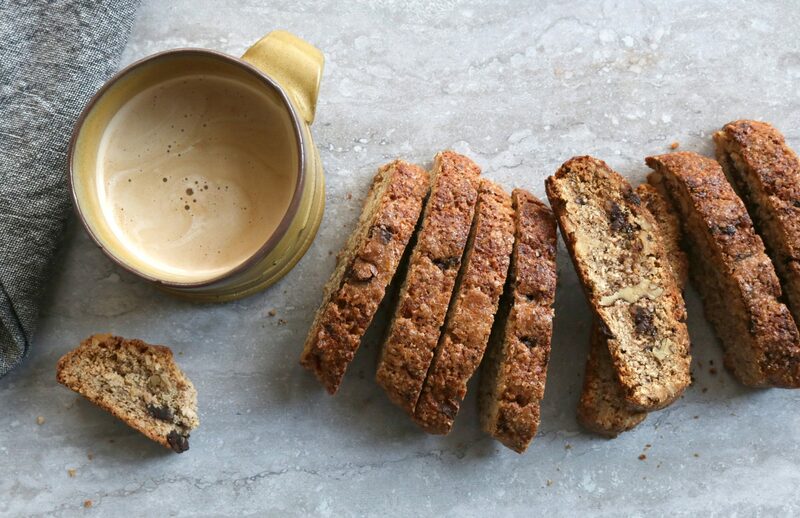 I tend to like carby, sweet-ish things with my coffee, and I feel like biscotti has more potential then it’s often given credit for. It feels so 90s to me – those big glass jars of awkwardly long cookies, often dunked lengthwise in waxy chocolate, on the counters of coffee shops that were just starting to multiply. I think some people decided that biscotti should be hard, and as such let them sit out forever, hardening. But in my mind they should be crisp and not an effort to bite into without softening them first in your coffee. So. 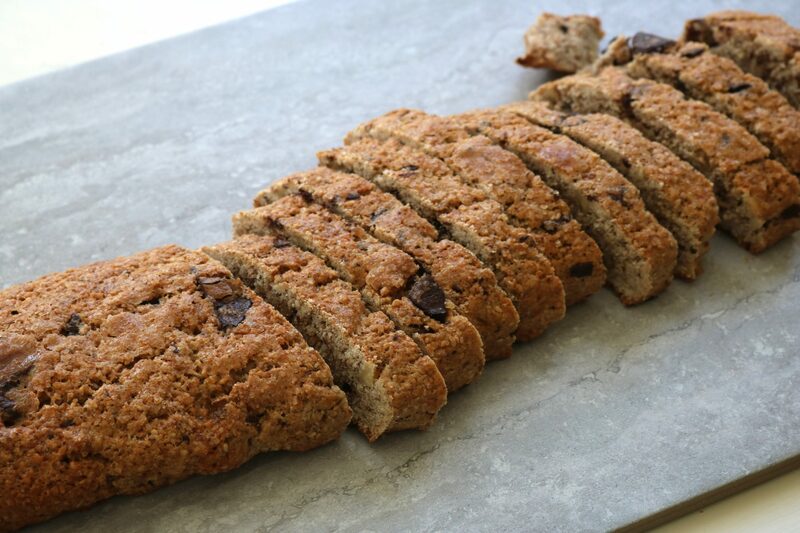 What’s special about these biscotti is that – ta da! – they have pureed beans in them. Which doesn’t make them heavy or cakey or beany or at all nasty – I promise no one will ever know unless you tell them. I made a batch for this morning’s Eyeopener, as we were chatting about plant-based proteins, and beans are still my favourite – cheap, accessible, shelf-stable and prevalent in every cuisine around the world, and I’m not sure why they aren’t more common in baked things, because they’re a great way to boost protein and fibre. I used some beans that came from the University of Guelph, and I’m not even sure exactly what variety they were, but they were beige. Generally it’s a colour issue – I most often puree white kidney beans, the canned kind, because they’re so nice and soft and puree so well, but last time I made these I only had red kidney beans, and the colour was just fine. I’d avoid black beans for obvious aesthetic reasons, but beyond that, anything goes. You don’t need to be able to identify a bean to cook it. 1Preheat the oven to 350ºF. In the bowl of a food processor, combine the flour, oats, baking powder and salt; pulse until the oats are finely ground. Transfer the mixture to a mixing bowl. 2Put the beans, sugar, oil, egg and vanilla into the food processor and pulse until very smooth; add to the dry ingredients and stir just until the dough starts to come together. 3With dampened hands, shape the dough into a log on a parchment-lined baking sheet, flattening it so that it’s about 15 inches long and 3-4 inches wide. (Divide the dough into two if it doesn’t fit on your cookie sheet, or make longer, thinner logs for smaller biscotti.) If you like, sprinkle the top with coarse sugar. 4Bake for 25-30 minutes, until golden and firm. Transfer to a wire rack to cool, then cut on a slight diagonal into 1/2-inch thick slices using a serrated knife. Stand the biscotti upright on the baking sheet, spacing them about half an inch apart, and bake for another 30 minutes, until crisp and dry. Makes 1 1/2-2 dozen biscotti. I honestly didn’t know that biscotti was supposed to be crisp and not rock-hard teeth breaking texture!